“I can’t wait for you to see the Cliffs of Moher!” my mother shouted at me over the phone. I was at work, a Google document of Irish landmarks I had made open before me on my computer screen. The only person who provided any actual input was my mother. She gave me a few of the obvious suggestions: Blarney Castle, the Ring of Kerry, etc. But during the course of our conversations, it became clear that what she really wanted us to see was the Cliffs of Moher. She had been there once before, when she visited Ireland with her mother and her brother. It was one of the most beautiful places she had ever seen. But she made me promise her that I would do one thing when we went there. It was possible, she said, to fall off the Cliffs and I had to promise not to let anyone go over the edge. As the oldest child of six, I’ve been tasked with many responsibilities when it came to my younger siblings. This, however, was the first time one of my parents had asked me to literally make sure that none of my siblings fell off of a cliff. I carefully planned out the first half of our trip, from Dublin to Cork. The second half, in which we’d drive through County Kerry and up the western coast, was less mapped out, but I had penciled in the Cliffs of Moher for the last day of the trip since it was closest to Galway, where we’d spend our last night. My father and my five siblings became acquainted with this rough itinerary on our first morning in Dublin over a gloomy Irish breakfast in our equally gloomy hotel. (Our accommodations were not my responsibility, but that of a travel agent, and were, for the most part, the sole reason our family will never use a travel agent again.) 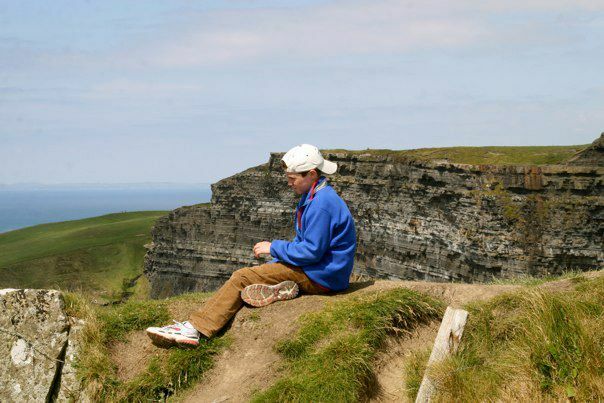 When it came up that we would visit the Cliffs of Moher during the latter half of the trip, my brother Aidan, who was 11 at the time, asked what they were. I said I didn’t know and left it at that, mostly because my smartphone was tucked away in my suitcase upstairs. My mom tried to explain their immenseness and their beauty, but Aidan wasn’t buying it. All he wanted to know was exactly how big they were. This was the genesis of a game that I like to call “Bigger or Smaller Than the Cliffs of Moher”. And while our anticipation built, our mother’s worry was reaching drastically new heights. 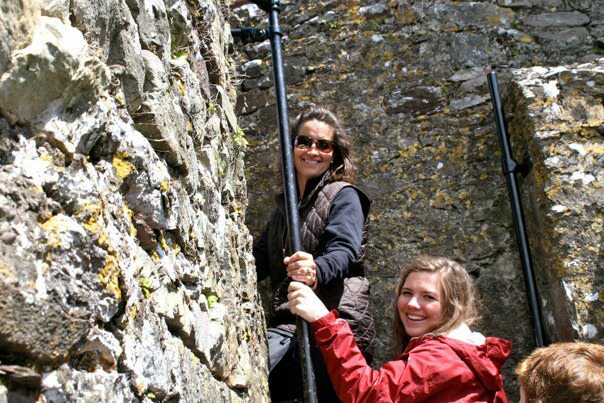 (I knew it was bad when we climbed all the way to the top of Blarney Castle and my mother spent the entire, wearisome climb up warning us all to let the guards hold on to us when leaned back to kiss the Blarney Stone, as if they regularly let people refuse their protection and tumble to their deaths. She refused to kiss the Blarney Stone herself.) To my siblings, the only thing more hilarious than Aidan’s fixations is my mother’s anxiety. 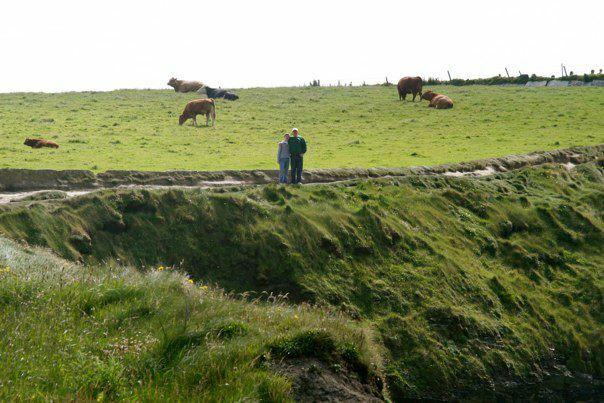 Every time the Cliffs of Moher came up, she plead with us not to go near the edge when we got there. “If one of you falls off, it won’t be because I didn’t warn you!” she would cry among the riotous laughter that rang through our van as it hurtled down country roads barely wide enough for a Fiat to pass through without suffering a few scratch marks. As our final day approached, she pulled me aside more than once to remind me of the promise I’d made. I assured her that nobody would fall off the Cliffs. However, by this point I wasn’t so sure. If she was this worried, then shouldn’t I be worried as well? And if someone went near the edge and started to fall, what was I going to do? Four out of five of my younger siblings were bigger than me. When we finally arrived at the Cliffs of Moher, my mother was practically convulsing. That morning, her entreaties for my siblings to stay away from the edge had been met with promises to the contrary. In fact, my brothers were still baiting her. As we were taking a series of family photos with the Cliffs in the background, my brothers intermittently stated that they were going to go up to the edge. By this point, we knew it was possible to do so by climbing over the dinky fences that run around most of the accessible parts of the Cliffs. 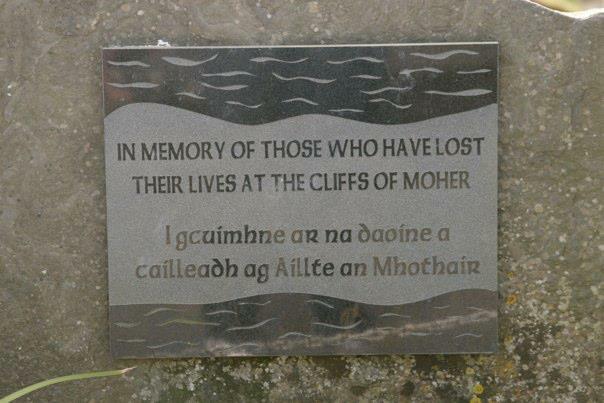 And I’m sure her fears were not allayed by the plaque dedicated to those who had lost their lives on the Cliffs. Eventually, she had had enough of everyone and walked far away from the edge to a point of safety. 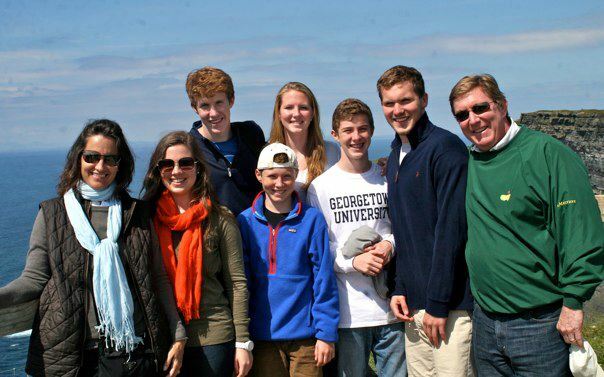 The rest of us – the six kids and my dad – were free to roam. I explored the Cliffs on my own – well, along with hundreds of other people – taking photos and watching my family members from afar. I discovered that the Cliffs of Moher are neither bigger nor smaller than themselves and that they are exactly like the Cliffs of Moher. And that my mother was right, they are breathtakingly beautiful. At one point, two of my brothers and my dad called to me. They were going to climb over the fence and wanted me to take a picture of them near the edge. I looked around nervously for my mother, but didn’t see her. I took a bunch of pictures and when they were satisfied, they hopped back over the fence, no worse for the wear. Once we were back at home in New York, my mother saw those pictures. I don’t remember her being angry that my brothers had gone near the edge. I think she was happy that we’d all made it out of Ireland alive. I was too. * And now, with almost two years between us and that trip, we’ve forgotten all of the things that put us on edge – the anxiety and fear and mental and physical exhaustion that can creep up on you no matter where you’re traveling – and remember everything rather fondly. Mention the Cliffs of Moher to any one of us now, including my mother, and you’ll be sure to get a smile. *Not only was I happy that no one had been blown off of a cliff, but also I was thrilled that we hadn’t perished when our van went airborne on a winding country road and scraped the side of an old stone wall. How my father got the courage to drive us around in that thing – on the wrong side of the road – I will never know. What a great story! Thanks for sharing Haley! You have captured the most important role of the oldest sister and belong in the Flannery Oldest Sister Club!!! 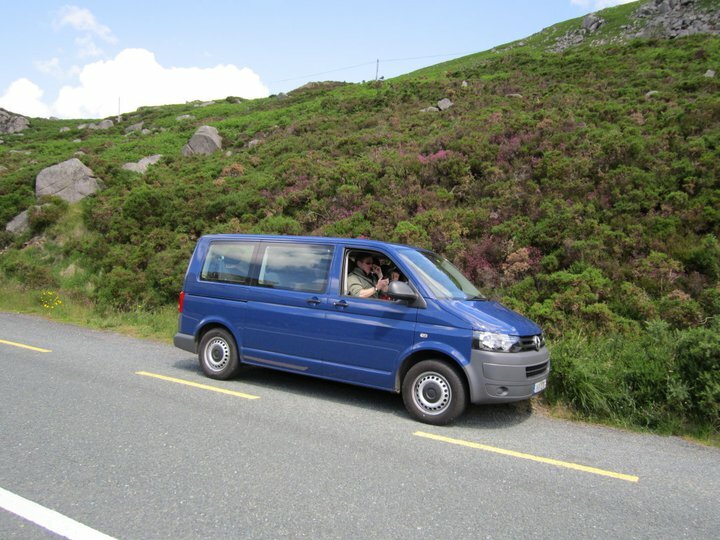 I certainly did not look forward to driving that VW bus across Ireland, but my passengers and their comments made certain that I would enjoy every minute – especially our navigator, Aidan. You captured it all! Haley, thanks for a great story! 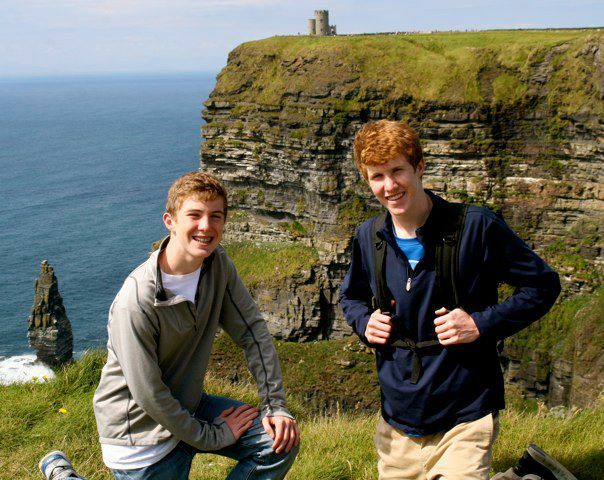 I had the honor of going to Ireland with your Grandparents and your Uncle Dan. 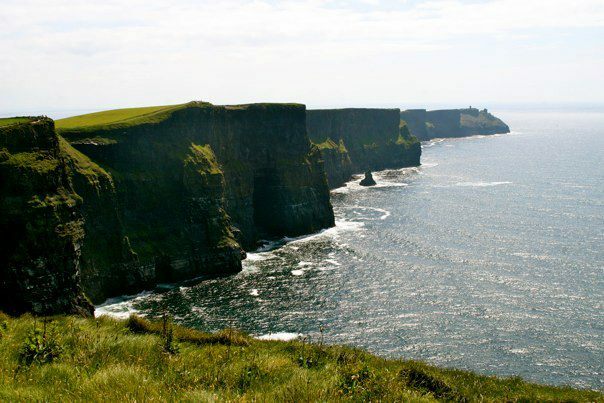 I remember seeing the Cliffs of Moher through blurry eyes as it was our first stop after landing in Shannon. They are spectacular! Your story reminded me of many of the fond memories I have from that trip, especially the van, as it was a source for much discussion. Eventually I believe I was banned from driving for going too fast, but we all survived and had a great time. Thanks for the memories! Thank you for reading, Stephen! I’ll have to ask my grandma or Uncle Dan all about your trip the next time I see them!